A solid app for speech and language professionals wishing to encourage accurate sound production whilst engaging children. 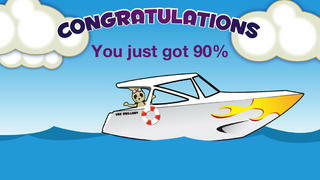 Drillaby Pro is a speech therapy game designed for use within a therapy setting by a speech and language professional. It offers an engaging interface that aims to encourage children to practise their production of certain sounds - an exercise which can easily become dull and frustrating under normal circumstances. This app aims to make the learning more fun by introducing a cute kangaroo explorer “Drillaby” who has to hop his way around a mysterious island in order to escape. The game is easy to set up, with the option to add several players along with choices of sound groups, word positions, difficulty levels and accents (the app offers US, UK or Australian voices). With all these choices, it is easy to customise the experience for each individual learner. The player then works their way through four levels of the game - each consisting of a set of adventure-related objects. The player selects objects one by one in the hope of winning a sticker for their album. Some objects are empty and nothing happens, but others contain a hidden word which must then be repeated several times. This can only really take place under professional guidance, since the assessment must be done by the user rather than being automated in any way. Once the learner says the word correctly the required number of times (dependent on difficulty level chosen), a sticker is placed in the album and another object must be chosen. After stickers for all four levels have been filled in, the game ends and a report of the words encountered and learner's success rate becomes available. It could become frustrating that the full game had to be played each time before any progress report became available, meaning that a commitment of 15-20 minutes of time would be needed each time the game was used. There is also an option to synch with a companion app, Drillaby Remote, to control the scoring buttons for students who are overly generous with their performance. The game featured child-friendly design and good quality audio, although I found the gameplay rather repetitive after a few turns (especially with the 'empty' objects to uncover too). Although it would engage a child better than a standard speech therapy drill, I'm not convinced that its use over multiple sessions to develop all the sound sets would sustain their interest. Overall, this is a technically sound app, but could maybe use a few tweaks to maintain user engagement in the long term. Drillaby is a speech therapy game designed for SLPs to use for articulation drills. Drillaby is appropriate for kids in preschool through mid-elementary. 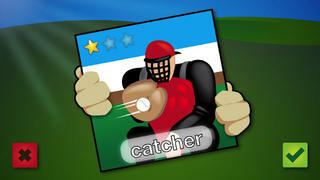 The app is designed to give kids lots of practice opportunities while playing a motivating game. 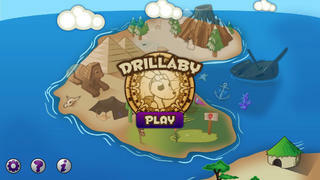 The object of the game is to get Drillaby through four different areas on an island and then home! The child must produce sounds correctly in order to get Drillaby on a boat and off the island. Drillaby was designed by certified speech-language pathologists. This articulation game includes a choice of six sound groups: /k/-/g/, /t/-/p/, /v/-/f/, /sh/-/ch/, /l/, /s/ and /s/ blends. There are three levels of difficulty including words in carrier phrases. Drillaby is an excellent complement to the SLP Minimal Pairs app for iPad, providing more words and levels of difficulty for practice. A great benefit of Drillaby Pro is the way it reinforces homework between therapy sessions. Therapists can recommend a single sound group version of Drillaby, which specifically targets the appropriate sound for kids to work on when parents ask for homework ideas. All sound groups can be presented in US, UK or AUS accents. Session records can be viewed for each student within the app or emailed as a .CSV attachment.